Whether you’re a human resources director, learning and development manager, or vice president of talent development, chances are you’re reading this article because you believe in making your organization a better place to work. But, there’s a common challenge that internal practitioners face. For example, you just left a meeting with your C-Suite discussing their concern with employee engagement survey results. The C-Suite thinks they don’t have the right talent on board. You think it’s an opportunity to establish a learning culture and a robust professional development program. What do you do? When you want to fight for a cause around the people-side of your business, how do you sell your ideas to your C-Suite? What barriers should you be prepared to overcome? How can you be more thoughtful about the tools and tactics necessary to gain executive buy-in and drive change? It’s important to look at the holistic picture of the components that make up a good idea and how to sell it. To help, I sat down with Deborah McCuiston, director of learning and organizational effectiveness at Virgin America (acquired by Alaska Airlines) and a respected internal change agent. Bringing forth a potential problem your C-Suite isn’t aware of shows you’re thinking long-term. When you have an idea that solves a business need, you can gain buy-in by answering these questions: What’s the risk of not investing? How would the organization suffer? Imagine what failure to make decisions looks like at your organization. The C-Suite will need to know the ROI of your idea, so relating them back to the bottom line is crucial. McCuiston is speaking of Refresh, an annual enterprise-wide culture event for all Virgin America employees. The first annual event uncovered a challenge that a majority of employees were experiencing: It was difficult to create a strong culture when a majority of Virgin America’s workforce was spread out across the country. Refresh brought employees together and mixed pilots, guest services, and senior leadership all in one room. As a result, both senior leaders and employees felt they had a direct connection with one another, which was important for a large organization with a dispersed workforce. In the end, the event created a family-like culture at a growing company of more than 2,700 staff members. Using familiar terminology and avoiding consultant speak requires a deep understanding of the organization’s inner workings. To get started, change efforts should begin with a look at the current state and an honest dialogue about the implications of not changing. The information senior executives find credible and reliable affects how an organization assesses its current state. While some C-Suites are looking for people analytics and big data, others only care about how it will save or make the organization money, and some simply want to meet other senior executives from organizations they respect to hear their story. The takeaway is to know what will gain (and keep) your senior leaders’ attention. This is where many internal and external practitioners get held up. Again, speak your C-Suite’s language and gather the relevant evidence they want to see, be it data, research, etc. McCuiston’s team recently partnered with Gallup to illustrate what the return on investment would be for a leadership development initiative. Gallup conducted research over the course of three months that enabled the Virgin America team to show value to their CEO and CFO, and for them to believe in and agree with the idea. “It took a combination of the right terminology and great research to sell them,” says McCuiston. Selling a large change initiative to your C-Suite the first time around may be met with resistance. This is only natural due to other factors like competing priorities, available resources and funding, or rapid growth, to name a few. Does it mean your idea is weak? No, it doesn’t. The key is patience. Build trust and credibility with your senior leaders through small and targeted OD initiatives that are executed well and deliver meaningful results. These smaller projects will be easier and quicker to implement, but when all is said and done, don’t lose sight of your big idea. There will be a time and place to bring it to the table again. If you don’t have touch points with the C-Suite, build relationships with colleagues who do. Ensure they’re aware of your change ideas and get them in your corner. 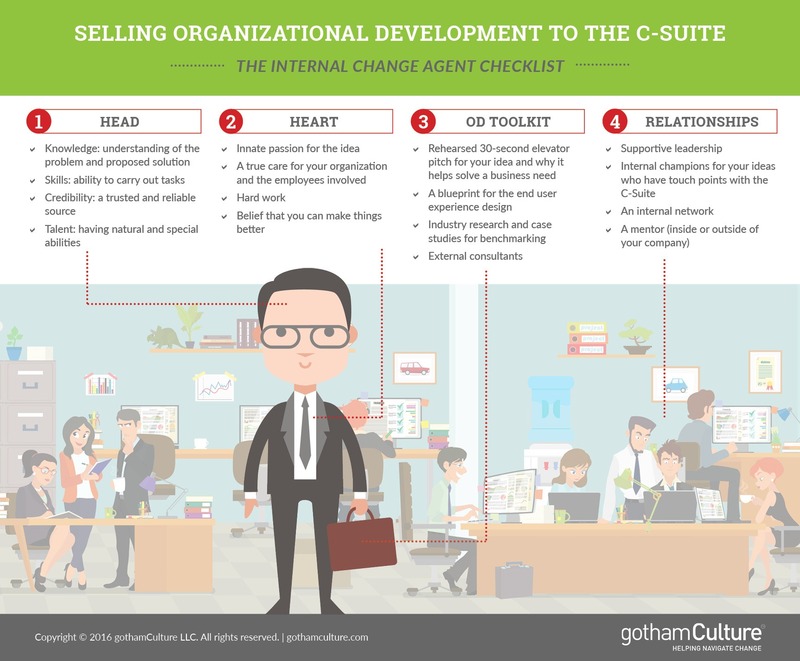 At gothamCulture, we think being an effective internal change agent requires a combination of the head, the heart, an OD toolkit, and relationships. You may not have all four of these components right now, but to drive change quickly in volatile or rapidly growing organizations, you’ll want to consider how you can adopt the right combination of these components and the elements under them. Hint: Your heart will help with executive presence. We agree with McCuiston: Be who you are, but know your audience and customize your message whether you’re communicating to the C-Suite or board of directors. 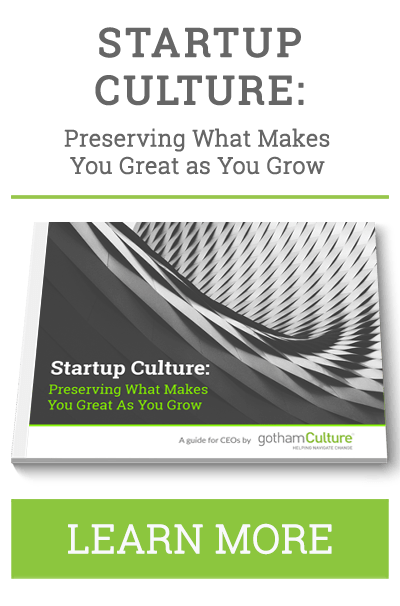 If you don’t match the culture in the room, your ideas will fall flat. External consultants may not be needed for every initiative, but they can bring fresh thinking and provide specific subject-matter expertise when needed. Consultants should work with you to figure out what the real problem in your organization is through dialogue, research, assessments, and data analysis/reporting. Along those lines, if you lead human resources internally for your company, you must be intentional about your role. When you’re sitting at the table with the C-Suite, are you their peer or are you selling a solution? It’s imperative that external consultants whom you bring in understand your role, too. 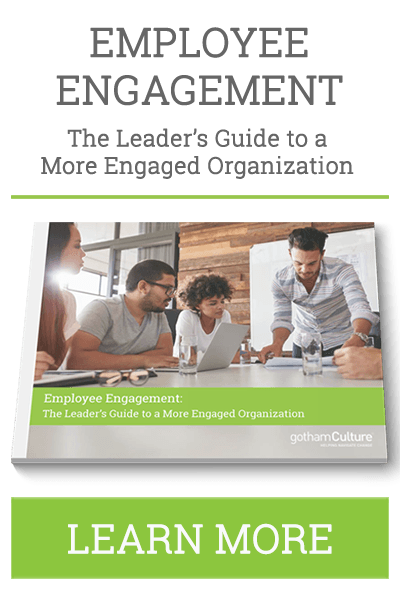 So, the next time your senior executives think replacing talent is the only way to increase employee engagement, yet you think the solution lies elsewhere, consider this change agent checklist. If all the boxes aren’t checked, identify the gaps and figure out how to close them. This will get you one step closer to breaking through to senior executives and building the credibility necessary to be a true internal change agent. Rachel Chadderdon is interested in improving company culture and employee development practices at all levels within organizations. Rachel is also passionate about aligning culture, leadership development, change management and communication to organizations’ missions, visions and overarching business strategies.